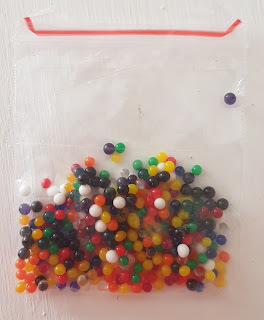 I wanted to do something a bit different to our usual play activities so I brought a small bag of water beads off ebay. I only used 1/3 of the packet and soaked them during the day and found the re-hydrating process fascinating! Would definitely recommend it for older kids! Once the beads were ready to go, we set them up in a shallow tray with a spoon and cup. Clay started off by just playing with them and picking up them up and naming the colour. Then he started putting them into the cup. Once I showed him the spoon, then he started spooning the beads into the cup. He happily played with them for over 40 minutes - definitely a successful play :) I've popped the beads with water into a series a sealed container ready for the next time.